The aim of this work was to examine the role of cytosolic phosphoglucomutase (cPGM; EC 5.4.2.2) in photosynthetic carbon partitioning. 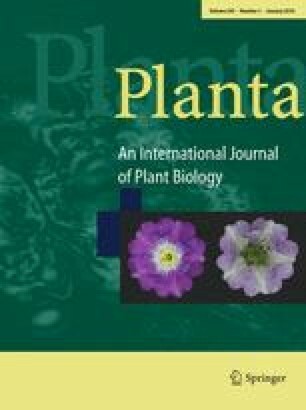 We have previously described the generation and characterisation of the tuber metabolism of transgenic potato (Solanum tuberosum cv. Desiree) lines expressing the StcPGM gene in the antisense orientation under the control of the 35S promoter. Here we extend the characterisation of leaf metabolism within these lines, examining properties of gas exchange, carbon partitioning, and the effect of the genetic manipulation on a wide range of metabolites including metabolites of the sucrose–starch transition, glycolysis, the Krebs cycle and amino acid metabolism. The data acquired in the present study surprisingly reveal that the photosynthetic sucrose synthetic capacity of the leaves is largely unaltered but that these plants display a reduced rate of photosynthesis, a dramatic reduction in nucleotide levels, and a general decline of biosynthesis. We conclude that these lines exhibit only moderate changes in sucrose synthesis but more complex changes on a range of diverse metabolic pathways.